Farmers Coop carries everything you need to raise a healthy flock including Purina Chicken Feed and grain for your chicks and game birds as well as other feeds to help support specific areas of chicken development. 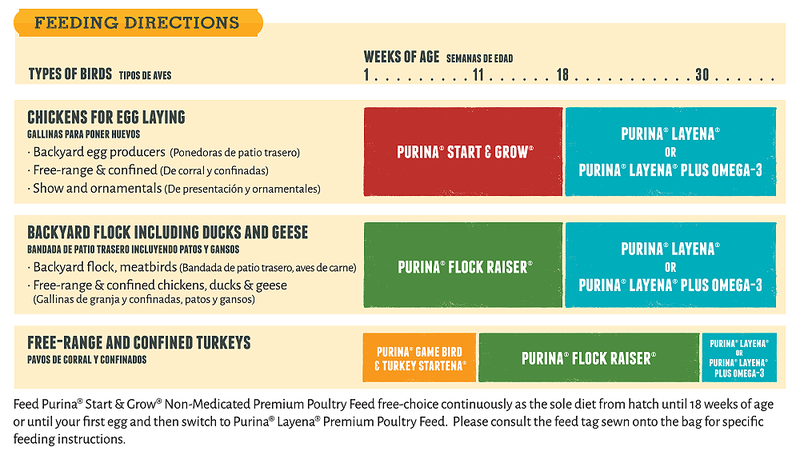 Purina Start & Grow feed is for young chicks to get off to a good start while Flock Raiser and Layena are products formulated to promote healthy digestion, egg production, and eggshell integrity. We also carry the full line of Layena Chicken Feed. Take care of your flock so they will take care of you. Come by one of our 17 Farmers Coop locations and talk to us about your flock’s nutritional needs. Optimum nutrition for raising laying chicks from hatch to laying age (18-20 weeks). This complete feed with 18% – protein and quality nutrients is perfect for a strong start and early hen development. Formulated with prebiotics, probiotics, and yeast to support optimum digestive health and immune function. A 20%-protein nutrient-rich ration that provides starting, growing and finishing nutrition for broiler/meat bird or a mixed flock of chickens, ducks and geese from hatch until laying age (18-20 weeks chickens, 20-24 weeks ducks; geese start laying the spring after they were hatched) and for turkeys from 8-10 weeks until laying age of 30-32 weeks.Optimum nutrition for healthy meat birds and mixed poultry flocks. Formulated with prebiotics, probiotics, and yeast to support optimum digestive health and immune function. Optimum nutrition for healthy birds and nutritious eggs. A 16%-protein, high-calcium ration formulated with prebiotics, probiotics, and yeast for top-producing laying hens once they reach 18 weeks of age. Now with NEW Oyster Strong System™ for strong shells. Oyster shell provides another source of calcium when the hens need it most. Oyster shell is a larger particle size than limestone. This means that oyster shell will stay in the digestive tract longer and will provide a source of calcium for egg shell production over a longer period of time than smaller particle sources of calcium. This is especially important at night when egg shell formation is rapidly occurring and dietary sources of calcium are limited because the bird is not eating. 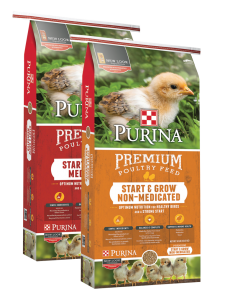 Purina Organic Chicken Feeds contain NO GMOs, NO animal by-products, NO artificial preservatives, and like all chicken feeds, NO growth hormones. Available in Starter-Grower, Layer Pellets or Crumbles, and Scratch Grains. This entry was posted on Wednesday, January 25th, 2017 at 10:45 pm	and is filed under Chicks, News & Updates. You can follow any responses to this entry through the RSS 2.0 feed. Both comments and pings are currently closed.